The violin bridge is an important component of the whole violin, that the violin can’t be played without it. The violin bridge lifts up the four violin strings at the center of the violin body, but its main function is to transmit vibrations throughout the whole violin. The violin bridge transmits vibrations from the strings to the top, through the sound pole and back. 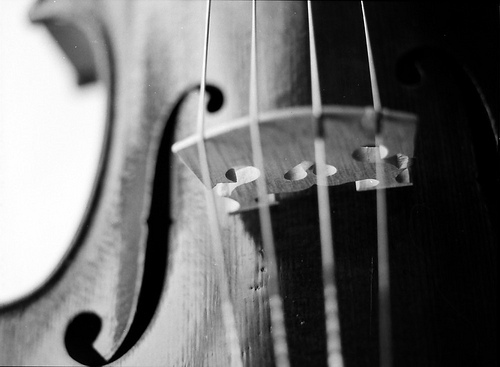 Hence, the quality and thickness of the bridge determines the impact of the sound produced by the classical violin. By putting on a violin mute onto the bridge, vibrations transmitted by bridge to the whole violin will be restricted. Hence, the violin would sound softer than usual with the mute on. It is usually done for night practicing or playing softer violin pieces. 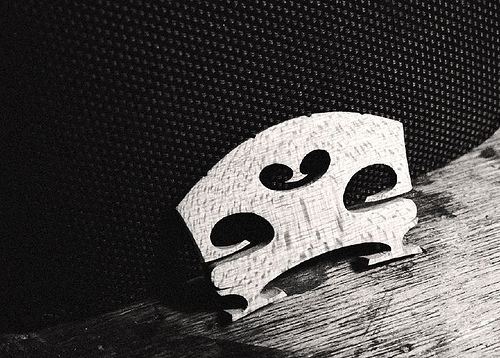 A good quality violin bridge does make a difference in the sound quality produced by the violin. However, the sound quality of the violin would be largely depended on the alignment of the bridge with the sound pole on the violin, than simply the wood of bridge. Here are some tips what to look out in a good quality bridge. The violin bridge must have a good curvature that carries the four violin strings at the right height for playing. It must also separate the four strings evenly so the violin can be played with ease. The thickness of the bridge do make a significant difference. The thicker the bridge, the more difficult it is for the bridge to transmit vibrations throughout the bridge. The violin would sound soft and weak. However, a bridge that is too thin may crack under the great pressure produced by the four strings. It might sound bright and loud, by it may not have the strength to withstand the immense pressure and vibrations of the strings. There are loops and holes in the bridge. Other than just for decorative purposes, the holes make the bridge lighter and allows it to project the sound to greater level. Different loops and holes make the difference to the sound quality. Most importantly, look at the four little gaps at the top of the bridge. Each gap is used for resting individual violin strings. A good quality violin bridge will have a gap which allows the string to go through freely, without dragging the bridge along. A gap which is too small will cause the string to pull the bridge, especially when the string is tighten. Note: Any slight movement of the bridge will cause a big change in tone and sound quality. While you can get the best bridge of the best quality, the difference in how a violin will sound relies heavily on how the violin bridge is adjusted on the violin. The alignment of the bridge goes hand in hand with the sound pole underneath. Hence, it should not be moved or adjusted unnecessarily. As the adjustment of the violin bridge requires high level of skills, it is advisable to look for a professional to adjust your violin bridge. Check out our Violin Music Shop for the latest updates on violin bridge! Look out for special deals and discounts too!